The workshop bought out many fascinating aspects of Libyan archaeology. As well as contributions from Libyan colleagues, presenters including Paul Bennett, Will Wootton from KCL, and Chris Blandford, who is preparing a World Heritage Management Plan for Cyrene. Also from KCL, Charlotte Roueche and Hafed Walda launched the Inscriptions of Roman Tripolitania and Inscriptions of Roman Cyrenaica websites. These a digital repositories of the corpora of inscriptions, gathered in Libya the 1950s by Joyce Reynolds, with the inscriptions marked up in EpiDoc XML What is most significant about these is that by using EpiDoc and describing the information within them using this standard, they provide the core for future work that others can build on in the digital sphere. It strikes me – a notion only reinforced by conversations with others here, including Charlotte, Hafed and Will – that the majority of the challenges will be non-technical. In the humanities we see publication as the final, finished thing (a view constantly reinforced by those in charge of pay, promotion and tenure), yet one of the most interesting aspects of the kind of work we do lies somewhere in between doing interpretive research and publishing it. How do we represent the interpretive process in the publication, while preserving its integrity and authority? This question is absolutely fundamental if we to get meaningful knowledge by applying computational approaches in the humanities. And it seems rather beautifully ironic that it should arise so prominently and urgently in the field of epigraphy – inscriptions would seem to be the ultimate ‘final publication’, but hey are not: walking round Leptis and Sabratha for the first time bought home the re-use and re-contextialization that an inscription can undergo before it comes to our attention, but before it was ‘published’ – it can be altered, erased, the block it is inscribed on used for something else entirely and so on. And the use of EpiDoc shows that we can continue building knowledge about them and their associations long after they have been deciphered, translated and pinpointed on the map. This week has seen some extraordinary events here in Tripoli, at the centre of which are three extraordinary people: Ken Oliver, Jeanne Hugo and Liz Barnett. In the last few years, these three have come to possess artefacts from Libya’s Roman past of great historical value. The appropriate time having arrived, all three have taken the decision – some would say it is a momentous one – to return these objects to their original location in Libya. Various news media have picked up on this including the BBC, and no doubt others have followed suit. Some years of negotiation and logistical planning have led up to this week’s handover of the artefacts to the Libyan authorities in Tripoli, supported by numerous people and organizations both in the UK and in Libya. The handover itself was marked last week by a ceremony in the Museum of Libya presided over by Mr. Saleh A. Abdalah, the Chairman of the Department of Antiquities. This was followed by an exhibition of the artefacts in the Museum’s soaring atrium, and a day-long archaeological workshop to which I and others from KCL contributed. The artefacts include the ‘Belgammel Ram’, which was returned by Ken. It is a bronze alloy battering ram from the prow of an ancient warship, found on the seabed near the mouth of the Wadi Belgammel (‘River of Lice’) in the 1960s. The ram is a magnificent, beautiful piece of metalwork engineering: one can readily see how it must have captured the imagination when it was discovered. Extensive scientific analysis was carried out on it in the UK prior to its return to Tripoli, and the ceremony included the presentation of reports on this work to Mr. Abdalah by Paul Bennett of the Society for Libyan Studies. The other artefacts, mainly domestic objects, are being returned by Liz and Jeanne, whose family have owned them since the 1950s when their father was a headmaster at a British army base in Libya. They include an assemblage of coins, mainly from the Christian period, but with at least five Islamic examples, some fragments of Roman glass including a blown flask with a separately attached neck and handle, terracotta figurines including two wrestlers, a gaming counter, miscellaneous beads, several small oil lamps, a larger lamp in the shape of a follower of Bacchus, and several chunks of floor plaster with mosaics attached. All of these will now go the the museum at Leptis Magna, the site from whence they originally came. The Museum of Tripoli itself is well worth a visit – we had a chance for a good look round in the hours before the ceremony – housed in a palatial building of the early twentieth century. It comprises two floors beneath three great polychrome domes, blue and white glass on the inside, blinding gold on the outside. Outside on the street, posters proclaimed the return of the artefacts. The collection is a varied cross-section of Libyan society and history, starting logically enough with a prehistoric room, proceeding chronologically across two floors to rooms devoted to contemporary Libya, and also to its future. 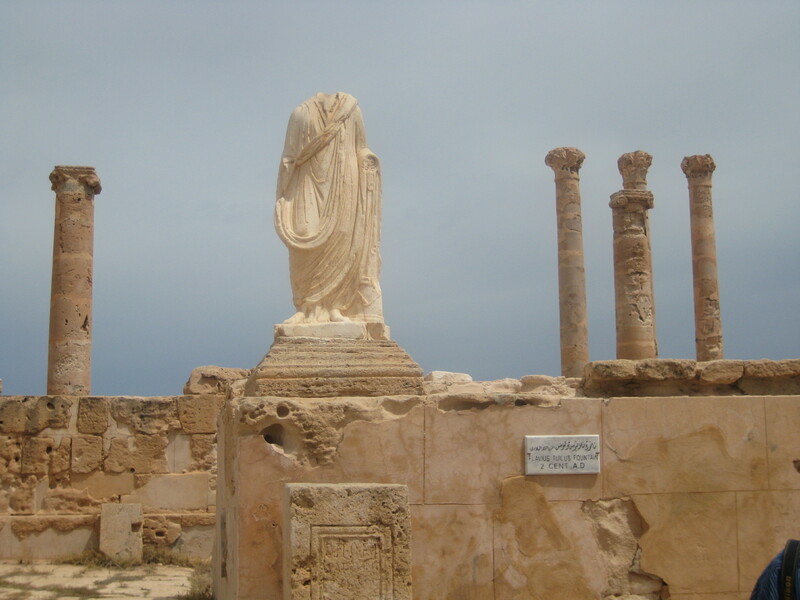 Whole rooms on the ground floor given to Leptis Magna and Sabratha, with statuary the main focus. Interesting to be reminded of the contrast between the solid soldier forms, and the more feminine draped figures… the old Mars and Venus thing, I guess. Much use is made of The Digital in this museum. Interactive 3D displays, some of them based on projecting lasers into vapour, monophonic chambers where you can stand under a sort of plastic umbrella and be the sole audience of a commentary (in Arabic) of the display in front of you, and a CAVE-live room with a floor on to which is projected an image of water, which moves as you walk across it. Very nice. The ceremony with which the artefacts were received this week, and the many conversations we have had about them, has given us a chance to reflect on the whole vexed issue of the return of cultural and archaeological objects to their ‘source countries’. Outside Libya, objects are detached from their human and cultural contexts. There must be many people out there – Libyans and non-Libyans – who have come to own such artefacts over the years. Hopefully this week’s events will raise wider awareness that there is both a practical model and a powerful intellectual argument for their return to Libya, and their public display there. Have just been to the British Library’s exhibition Magnificent maps: power, propaganda and art. This fantastic, beautifully curated, must-see exhibition traces the history of the map as an object of the projection of (mainly colonial) power. This can be either direct and intimidating – Besson’s 1709 “‘L’Etat du Duc de Savoy de ca et de la des Monts, for example, is a blunt statement of the consequences for the Duke of Savoy should he continue to resist French power in the region. But other details hint at how maps can reflect tensions in the thinking of the times. Fra Mauro’s 1448 Mappa Mundi is noteworthy because, having carefully surveyed all available knowledge on the subject, Fra Mauro concluded that, on balance, the Garden of Eden could not be cartographically represented as a place on Earth, so he detached it and placed it separately in the bottom right hand corner. One wonders if a taxonomy of such challenges to conventional thinking in cartography over the ages could be developed. Fascinating too are the more human stories — one can surely see the verdant plans of seventeenth century landowner’s domains as talking points over the fireplace to impress visiting neighbouring lords of the manor. The Sheldon tapestry map of Oxfordshire is a particularly good example. One can tell, from the way that all possible topnyms have been included, at the expense of all else that this is basically a visual inventory of possessions. It brought to mind, tangentially at least, the way that multinational corporations flex their muscles by listing/flaunting all the places they do business. Splashed out on the excellent exhibition guide in the BL bookshop, but resisted the temptation to buy a £3700 atlas. This week I’ve been at a seminar at the British Academy, E-Research on Text and Images, organized by the e-Science for the Study of Ancient Documents project at Oxford’s Centre for the Study of Ancient Documents. This project focuses on a collaboration between medical image processing and papyrology. The principle is relatively straightforward: the Roman texts that the project is studying – the Vindolanda writing tablets – are very imperfectly preserved, either as inkstrokes on the original material, or as incisions left on wooden writing tablets originally covered by wax, which was written on with a stylus. Images of these surfaces can be captured using steroscopic imaging, which systematically compares the lighting from different angles, thus showing up inconsistencies in the surface that might otherwise be invisible. Project postoc Segolene Tarte outlined the approach in her paper, stressing that this was a formal technical way of supporting the kind of thing that papyrologists would do anyway without recourse to technology. Good examples were given of how this approach can lead to different interpretations of individual words, which can have significant impact on the overall interpretation of the text – one key example being the ‘Frisian Ox Sale’, where imaging supported a re-reading of a word previously interpreted as ‘BOVEM’ in fact read ‘QUEM’. This casts in to doubt the document’s overall identification as a bill of sale for an ox (see Bowman et. al.’s paper). Next up, Simon Tanner of CCH presented work in his involvement with the Dead Sea Scrolls digitization project. This gave an interesting perspective on how documents are treated once they recovered. The noble aspirations of the Israel Antiquities Authority to make the Scrolls visible to the wider public came inevitably unstuck in places, due to imperfect understanding of conservation practices in the 1950s but more so perhaps because of the rather unsystematic way in which the fragments of scrolls were classified and grouped at the time. This raised an issue which emerged as one of overarching importance: that it is essential to document what we are doing, why we do it, and when we did it. Documentation of process is critical not only to the integrity of conservation – which is too often, I think, seen as a purely physical activity – but as we enter deeper engagement between the humanities and digital technologies, it becomes a central part of the intellectual process too. Melissa Terras and Henriette Rouede-Cunliffe picked up on this in their presentations on formal models of reading papyri and supporting and documenting decision making processes. A comment from the floor made the point that, historically learned institutions like the Royal Society call their publications ‘Transactions’ or ‘Proceedings’; which reflect intellectual processes and the exchange of knowledge, rather than the kind of ‘here is my final scholarly outcome which will go in the library and stay there forever’ that the current reward, credit and funding systems in the humanities require of us. This led to a substantial last-minute rewriting of my own presentation on the following day, which tried to make the point that reconstruction of cultural heritage sites (and indeed artefacts) have in the past been consciously constructed ‘finished’ entities, often with their own intellectual and/or political messages. However, I suspect that technology may be presenting us with certain opportunities to begin to express and encode the processes that lead us to reconstruct sites in different ways. One of these opportunities lies in motion capture, and the recording of present-day spatiality. Robert Shoemaker‘s paper immediately before mine focused on linking and integrating textual material, including material from the Old Bailey Online project. Whilst such texts may not face the kind of physical or conservational problems that payprologists face with material such as Vindolanda, this was a nice reminder that reading a text can mean many different things, and that quantitative understanding of the reading process is often the key to understanding the text itself. Of course all of this needs e-Infrastructure. The papers of Dot Porter on the TILE project, and John Pybus on Oxford’s BVREH work both set out different approaches of how virtual research environments can support this kind of work. Oxford’s Mike Brady – Co-I of eSAD, and an expert of medical imaging – summed it all up nicely when he noted that the Two Cultures of CP Snow should be rejected, and that the humanities and sciences face exactly the same kind of linear, interpretive problems. The challenge is how we document the processes that lead us to the answers. So now we know — the Battle of Bosworth, marking the beginning of the Tudor dynasty in 1485 was actually fought a site in fields more than a mile to the south west. This is a salutary reminder that ancient battlefields defy the concept of ‘pinpointing’. They have this habit of spreading out over wide areas, or being fought over several days in several locations, and that treating a battle as a single event in a ‘names, dates and kings’ sort of way is not always a good assumption to make. How true also of the Classical world, when of course historic battles played sucha key role in the forming of tribal and political identities. I awaut the team’s findings with great interest… Speaking of the Battle of Bosworth however, I found myself last weekend in York’s Richard III museum. This crazy and wonderful building is the Monk’s Bar gatehouse, complete with functioning portcullis. The top storey was supposedly added by the man himself in 1484. There’s not a huge amount to see inside in terms of objects, and it is undeniably very family-oriented, but the approach of filling the original space with a load of historical and biographical information, and posing the important historical questions (including the influence of Shakespeare on the reputations of those involved) works very well.